Contains evening primrose oil, jojoba oil, vitamins A and E, provitamin B5, hyaluronic acid, chamomile and a high concentration of multilamellar liposomes. These have a strong moisture-dispensing action in the skin. 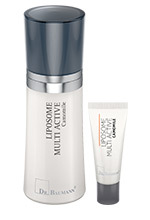 Active substances are taken up by the liposomes and transported into the skin. Chamomile calms the skin.